Res Ipsa Knit With Her: Happy New Year! I realize I'm a little late but we spent New Year's in San Jose del Cabo, Mexico. We had a wonderful time but unfortunately I could not get an internet connection to post to my blog. I'll have to check in to that before I book my next vacation spot! In lieu of blogging we enjoyed the beach and the mexican markets. The kids took surfing lessons and went horse back riding. I even had some great knitting time to work on my Hyphen Boy bag and my Cozy wrap. Photos of those will follow in future posts. My folks were with us on the trip so for today's viewing pleasure here is a photo of the wonderful scarf my Mom was working on. She is using Cherry Tree Hill silk/merino blend in the worsted weight. I believe this colorway is blueberry something. This is the second scarf she has made with this pattern and they feel and look wonderful. 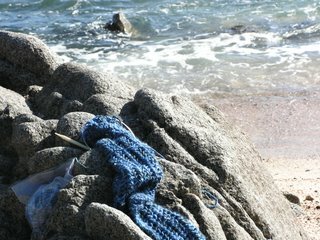 It definitely struck me as a scarf that needed to be photographed at the ocean! While we were there I thought about New Year's knitting resolutions so here goes: 1. I am going to try to purchase less yarn this year and actually knit from my stash (sorry Hollis! ); 2. I'm going to try to get some of my UFO's finished; and 3. I'm going to try to attend some of the knit nights at my LYS. So what are your New Year's knitting resolutions? I wish all of you a wonderful, wool-filled 2007! thanks for the tip on the bag kal!! I'm so jealous I want to go to the ocean!! and a very lovely photo of your mom's scarf it looks great..
Are you going to Stiches West?? I am going to see if any classes are available and make room reservations. Wanna meet up and you can watch me buy yarn!! LOL. What a great picture. Glad you had a great time. I have given up on trying to knit only from the stash, I just can't last on those yarn diets. I am going to finish UFO's though every month before I start something new ... except charity knitting, that shouldn't count ... right? Love the picture!! Looks like you had a great time in Mexico! I would love to be somewhere warm knitting right about now!! (by the ocean would be an added bonus!) I'll have to enjoy it vicariously through your picture! !